It’s Monday morning, I’m rushing around the house to get my son off to school, making sure I have everything packed for my work trip and things taken care of at home when I realize just how awesome my job is. There are so many people who go to work every day, just going through the motions. I go to work every day and get to live my passion. I grew up in a family where wine was a part of every gathering. When I think of wine, I think of a celebration, but I never thought of it as a career. My path to my passion wasn’t linear. I went to the University of Southern California to study psychology and had a few internships and jobs in entertainment marketing that were great, but it wasn’t what I was passionate about. I went back to USC, earned my MBA through evening classes, and got my foot in the door at a wine supplier, earning a Wine & Spirit Education Trust (WSET) level II certification while there. I then ran across this job opening at Kroger – halfway across the country – and knew it was the job for me. One year ago, I flew to Cincinnati with my family and joined my amazing team here at Kroger. With the help of my team, I manage nearly 13,000 SKUs of wine – more than 200 of those SKUs exclusive to Kroger – across 2,204 stores throughout the country. My job is to watch market trends, source suppliers and use data from 84.51° to ensure that the right bottles of wine are on the right shelves. Sure, there’s a lot of data science behind making sure the right selection is in the right place and that the most popular national brands of wine are in stock, but there’s also me, visiting wine regions around the world, tasting, touching, feeling and picking the perfect grapes while working with suppliers to design the perfect bottle and label before a new exclusive wine hits our shelves. We take pride in the journey from grape to glass of every one of our exclusive brands and I am extremely proud of the 34 new exclusive brand SKUs that will be hitting shelves nationwide this spring. My team and I have sourced the best of the best from around the world for our customers and I couldn’t be more pleased. They’re fantastic! Just look for the “Exclusively for You” tags in our stores and try one! 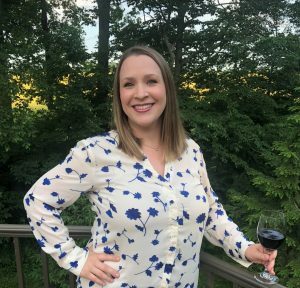 I’m Sarah McGovern and I am Kroger’s national assortment manager – Wine.